You may have started your veggie seeds nearly 8 weeks ago in flats, around mid-February. It’s now time to put these in the ground. If you didn’t start your own from seed, stop by your local Grangetto’s or nursery and pick up your favorite warm season veggies. First, pull up and throw out or compost the remains of your winter garden. A thorough cleaning now really pays off in fewer bugs and diseases later. Dig up the soil deeply with a spade, turning it over, aerating it, and breaking up the clods as you go. Then use a garden fork or shovel to mix in organic amendments. 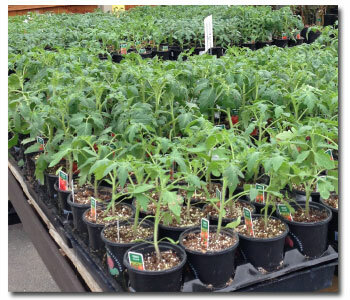 Add a good vegetable fertilizer according to package directions such as Lilly Miller® Tomato and Vegetable Food; work this into the top 6 inches of soil. If you’re an organic gardener, use instead blood meal, cottonseed meal, bone meal or bagged organic vegetable food such as Dr. Earth® Organic Tomato and Vegetable Food. Then use a garden rake to level the ground. Use a hoe to make furrows between rows in heavy soils. Plant tall crops to the north, and short crops to the south. Full sun is best for all winter vegetables. The only thing left to do is water, wait for harvest, and enjoy!